8 days of great anticipation. Not gonna lie, may have had a mini countdown. Get ready, this post has perma-smile written all over it. 8 ladies. 8 little black dresses. Lovely bride-to-be. Private room. Intimate setting. Dark wood panelling, blonde wood highlights. Beautifully grand table. Cream leather chairs. Complimentary flutes of prosecco. Sets the scene quite nicely, non? Chef Jason walks in, welcomes us warmly and within seconds, manages to charm the stilettos off every single lady. Hell, we probably would’ve agreed to eat pig’s feet had he suggested it. So, we order and the perks of dining with 8…wider menu coverage! Excited and could hardly wait to try as many dishes as possible. Most excited to try the burrata and butter poached lobster. Best mozza you’ll ever taste in your lifetime. Ok, best mozza I’ve ever tasted in my lifetime. No exaggeration. So fresh. So unbelievably fresh. So light. 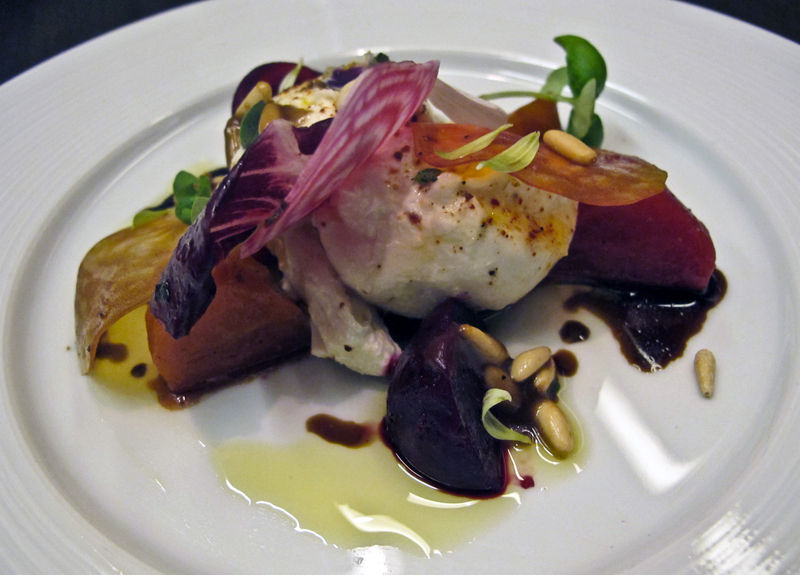 And the marjoram and pine nut vinaigrette…don’t know how he does it. Frankly, don’t care. Just give me more. 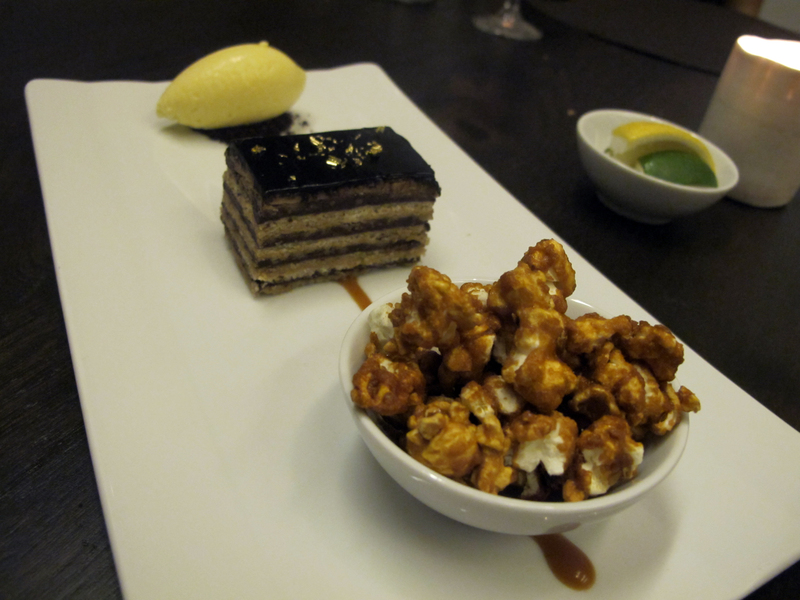 Or, we could sit and stare at this fabulous dish all day long…look at that presentation! [Sidebar] Not a beets fan. Very much want to like, because they’re so damn pretty. And, anything that pretty must taste good, right? Well, with some mozza & v, best beets ever tasted. Always drawn to scallops. And sashimi. Lingered over this one on the menu. 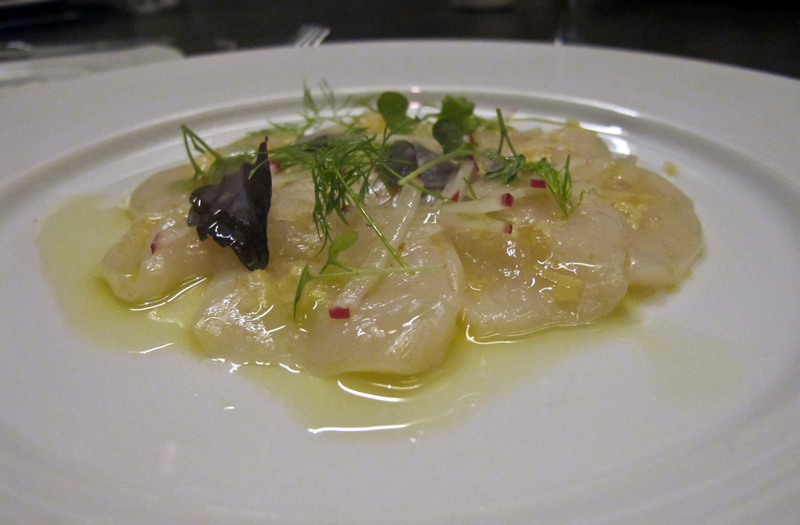 Slices of sashimi with a subtle hit of ginger; vinaigrette was a delicate balance for buttery smooth scallops. 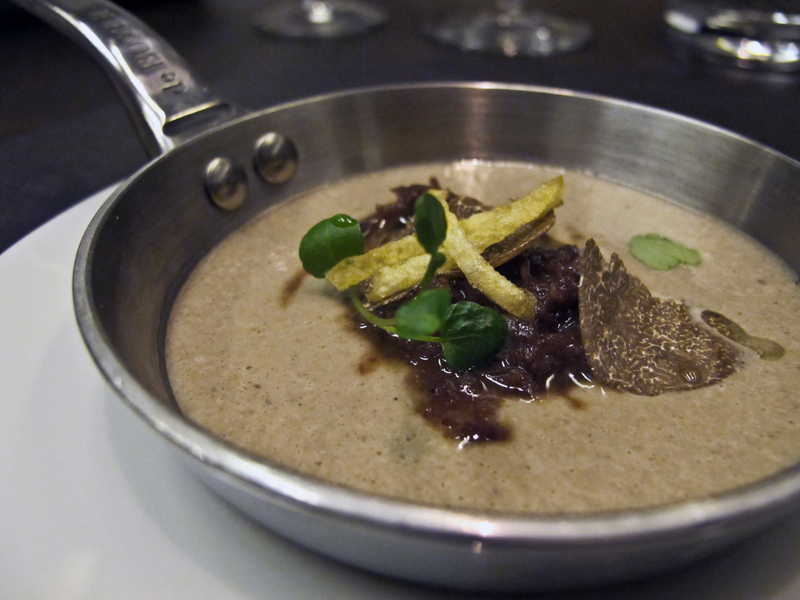 If heart wasn’t already set on the burrata, foie gras torchon was a close runner up. 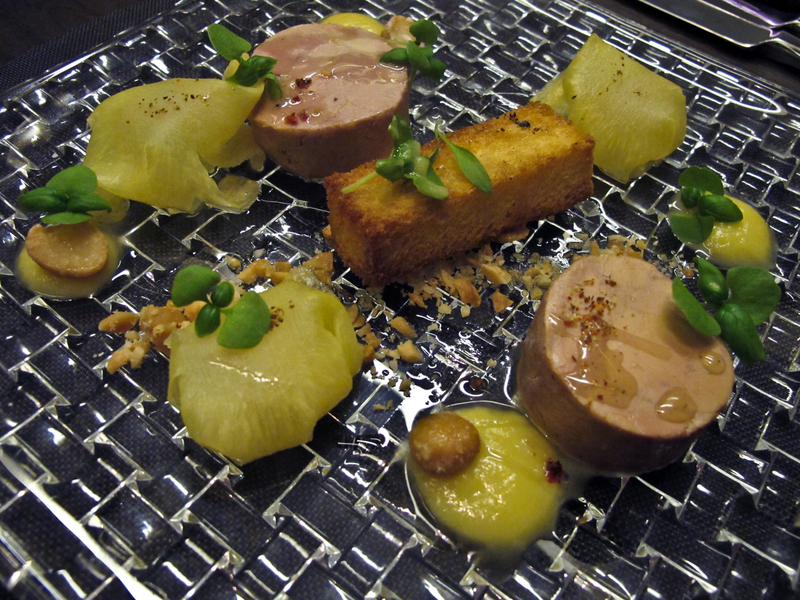 Cava still lingers as best foie gras, and willing to try others…just to see, you know? And this was close. Very, very close. Wish I had snuck in another taste. Imagine, scrambling across that beautifully large table in black dress. Would’ve ruined all pretense of classiness. Promptly. Alas, next time. But, wait! Must have the burrata again. Oh, the dilemmas we face sometimes. 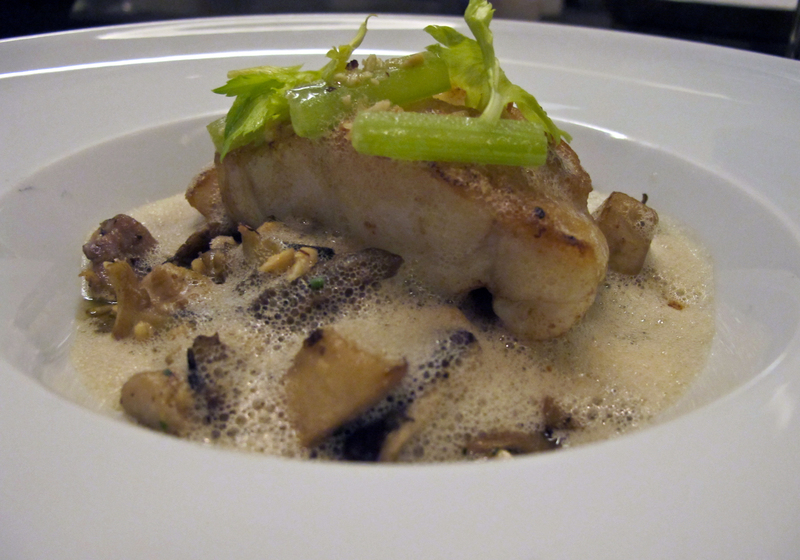 Chef Jason popped back in at this point with a surprise dish and the smell that wafted over…oh la. Truffles. If ever an ingredient could be described as pure decadence…if ever an ingredient could add that element of je ne sais quoi… if ever… you know I could go on. An adaptation from his signature dish at Auberge, he served with a knowing smile; knowing we’d fall head over tummy in love. Must feel nice to always be right. We practically licked our little saucepans clean. Gnochhi like you’ve never had it before. 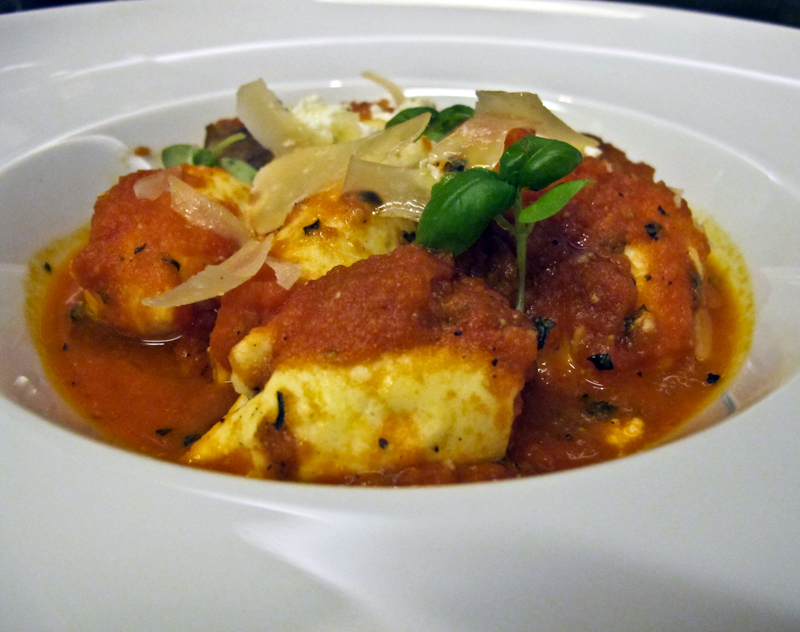 A cloud of ricotta. Yes. A cheese cloud. Most apt description I could think of. And not heavy at all. Oxymoron? Perhaps…just go with me here. 3 ladies ordered…3 identical exclamations of “ahhh, so good”. If you’re a gnochhi lover, try Luma’s. You’ll never go back. 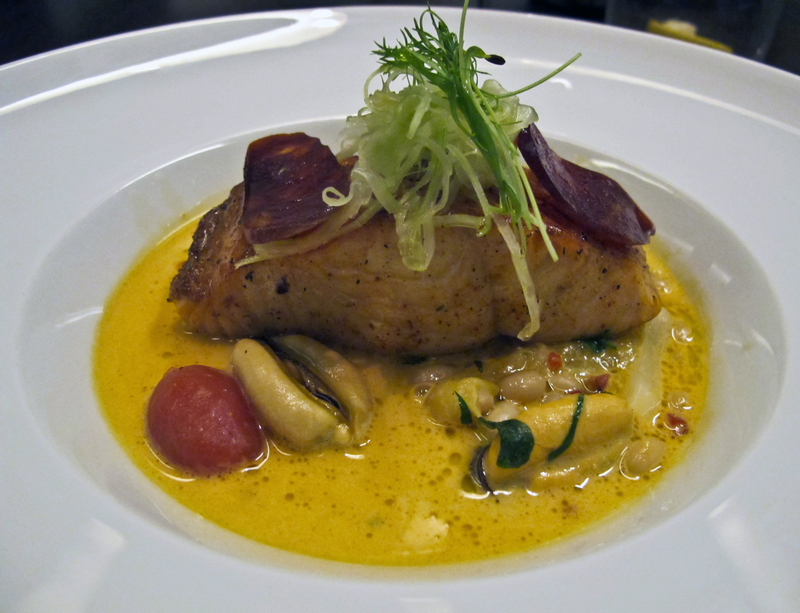 The baked salmon had caught J’s eye and if we were honest, the salmon simply acted as a conduit for everything else…mussels, chorizo, piquillo pepper and saffron rouille. Fleeting impression from one forkful…spicy & flavourful. Damn table was too big. Couldn’t scramble. Who doesn’t love mushroom foam? Who doesn’t love mushrooms? Who doesn’t love porcini cream? Perfectly cooked. Flaked immediately at the touch of your fork. Fleeting taste. High expectations. 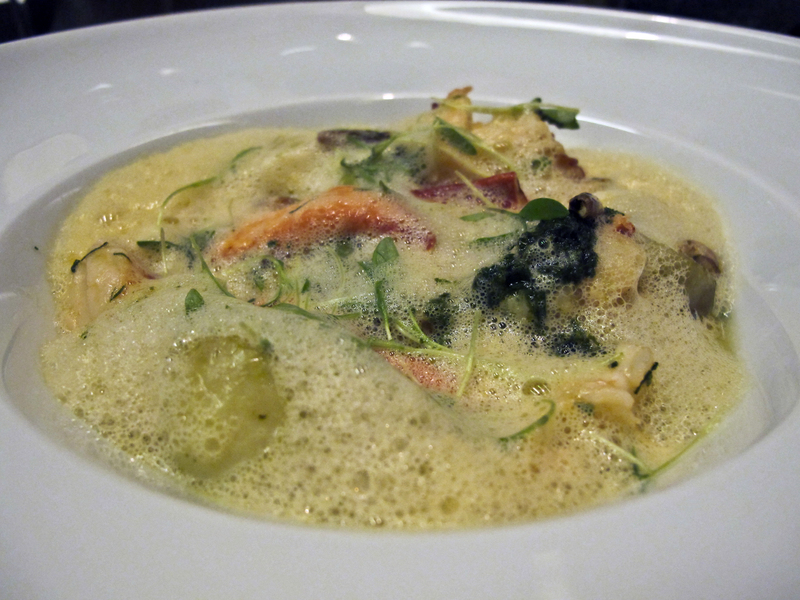 May or may not have had lobster two nights prior at EPIC at the Fairmont. Listen, it was the best week of dining and I was celebrating the gorgeous bride-to-be. How that directly translates to permissible lobster, haven’t quite worked it out. Verdict: Best lemon tart in the city. I kid you not, the rumours are true. Believe ’em. Light, creamy and tart with a brûléed top and a thin layer of crust. Ridiculously good. Small scoop of sour ice cream and the combination is lemony tartiness h-e-a-v-e-n.
Will be honest. This takes a back seat. Way back seat to the lemon tart. A huge chocolate & caramel fan. 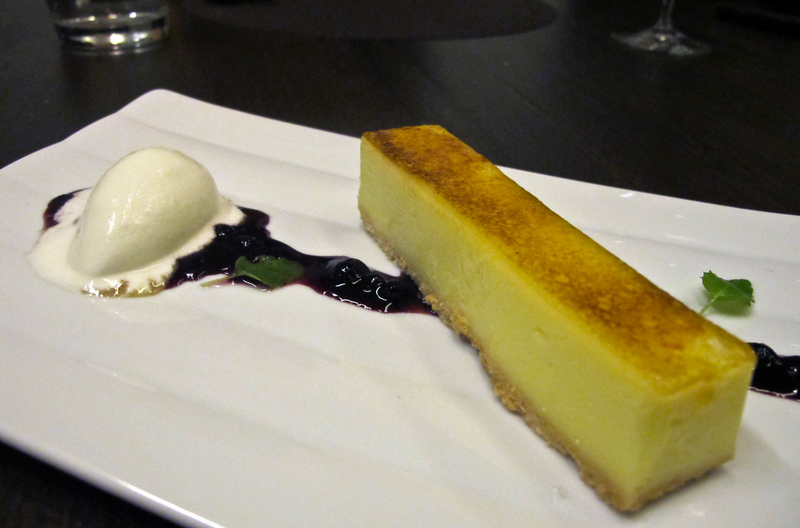 But when up against lemon tart goodness, no contest. Whew! Indulge, we did. Our little black dresses were a wee bit tighter at this point. Worth it? Absolutely. Overall, food was outstanding. Service was impeccably warm & attentive. From the extra little touches, to the wonderful team of 5-7 who rotated seamlessly throughout the night, to the generosity of general manager Richard and Chef Jason – it was a spectacular dining experience. Many many thanks for making our night so special! [Sidebar] Mildly disturbing how often I think about the burrata. Kinda like a good date. Wait. Nevermind. Let’s not go there. Good thing we’re back at Luma on Friday. To get my fix, of course.